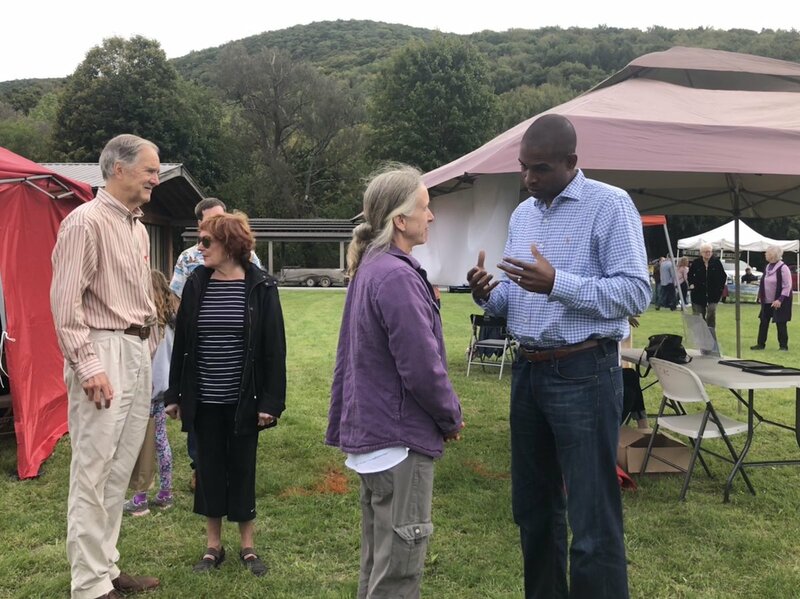 Hyde Park, New York — In one of the most critical battleground races of the Congressional midterm elections, Democrat Antonio Delgado held the last town hall of his campaign in Dutchess County on Friday, seeking to cement his relationship with constituents and drive home his message of unity and solutions-based leadership. Delgado is attempting to swing New York’s 19th Congressional District out of Republican hands, part of Democrats’ national effort to win back the House of Representatives this fall. He’s facing incumbent Republican Rep. John Faso, who is seeking a second term representing parts of the state including the Catskills and Hudson Valley, north of New York City. The race appears close in a swing district with nearly even Democratic and Republican voter enrollment. It voted for Barack Obama in 2008 and 2012, then went for Donald Trump in 2016. The district is nearly 90% white, and is characterized by small towns, a large constituency of farmers, small businesses, and the working poor, with huge infrastructure projects running through it like the Metro North rail line and the Taconic Parkway. Winning what was then an open seat due to the retirement of former Rep. Chris Gibson, a moderate Republican, Faso beat Zephyr Teachout in 2016 by a 9% margin as Trump won the district and the presidency. Tuesday’s polls showed this year’s Faso-Delgado race to have razor-thin margins, though Delgado was up by 5 points in the most recent Monmouth survey, other polls show Faso leading. Outside money has poured into the race, with both candidates receiving support from the national campaign committees of the two major parties, though controversy has accompanied ads paid for by Republicans. Both candidates have expressed support for bipartisanship in Congress, for local farmers, for bringing businesses back into the region, for protecting the gorgeous upstate environment, and for combating the opioid epidemic. They differ along party lines on other central issues to the campaign like gun rights, abortion, immigration, military funding, and healthcare. Over the course of an hour and a half on Friday night at St. James Episcopal Church in Hyde Park, Delgado spoke of his youth growing up in Schenectady and and his wife’s background in Woodstock, saying that coming from working-class families meant they were both raised with an idea of what it meant to “grow up before greed.” He pitched a return to the values of his youth, when the working poor was not the largest growing class in America and teachers and education and labor were, according to him, valued differently. Delgado’s central message to the roughly 100 people gathered — some of whom were clearly already supporters — was that his style of leadership and representation would emphasize accountability to his constituents and a higher moral standard for political leaders. At times prompted by questions and at times not, he repeatedly pitched a vision for the district that includes bipartisan infrastructure investment and decriminalized substance abuse, as well as job growth while preserving the environment. He emphasized civil discourse. Delgado, who is African-American, is running against Faso, who is white, on a liberal platform in what has been a heated campaign where race has been a significant factor and racism has boiled to the surface. Should Delgado win, he would be the first person of color to represent New York’s 19th district in Congress. But Delgado hasn’t focused on race in his campaign — rather the need for a set of elected officials who can find common ground when dealing with diverse views and perspectives. Even as the National Republican Congressional Committee has run a series of ads highlighting the Harvard-trained lawyer and Rhodes scholar’s past foray into rap music, which many have called racialized or racist. Delgado’s focus on issues he sees as unifying a divided constituency was clear as he sought to make his closing pitch, win votes, and inspire volunteers in the final days before the election. He gave charismatic oratory and detailed answers to questions about complex problems throughout the night. President Trump is supporting Faso, while former President Obama has endorsed Delgado. The race has received national attention both due to its closeness, as well as the amount of money raised and spent by both sides, and the controversial ads. While the attacks have flown, both candidates have also preached bipartisanship, understanding that the path to victory is through voters in the middle, perhaps many of them unaffiliated with any party. “Rebuilding and remaking this country anew, economically speaking, is where we can meet across the aisle,” Delgado said on Friday to a round of applause. For his part, Faso has run his campaign on promises to work on bipartisan legislation on healthcare, fixing immigration policy, climate change, and infrastructure. While Delgado applauded Faso’s support of the STOP Act, which deals with opioid abuse, on Friday he criticized several of Faso’s first term choices. Delgado disavowed Faso’s vote for the Financial Support Act, which he said enables risky lending practices for large banks, among others, and accused him of being swayed in office due to donations from big pharmaceutical companies. In contrast Delgado asked those in attendance to remember that his campaign has not taken any money from those drug companies. Faso voted against the Trump-led tax overhaul and voted for the Trump-supported American Health Care Act of 2017, which peeled back aspects of the Affordable Care Act, known as Obamacare. After beating out seven other Democrats in the June primary and earning 22% of the vote, Delgado has been able to raise significant funds and excite audiences with his speeches, but while polls show a close race, only Tuesday will tell whether he’s been able to capture enough of his primary opponents’ supporters and earn the confidence of thousands of other voters in this swing district. In New York and across the country, every seat in the House of Representatives is on the ballot this year, and as Democrats attempt to swing the chamber and take some control of government in Washington, the Delgado-Faso race is seen by some as one of the most critical bellwethers. If Democrats are going to take the House, it is the type of race they need to win. On the ground in Hyde Park before the town hall, constituents expressed very different needs and takes on the race, in which there are two other candidates: Steven Greenfield is the Green Party nominee, and Diane Neil is running as an independent. Lesley Pinto, the 20-year-old owner of El Guacamole in Hyde Park, plans to vote for Delgado in the hope that her two small local businesses will receive tax breaks, allowing her to buy a house with her husband, Carlos Pinto. She also likes his stance on immigration laws, as both her parents and many friends and family are Mexican immigrants. A 71-year-old man and his wife who own a small jewelry store in Hyde Park are firm Faso supporters. They spoke of their concern that social welfare programs are cutting into their profits as the minimum wage rises and tax breaks don’t favor them -- and they expressed doubts about Delgado’s promises to help small businesses. Episcopalians, they support Faso’s anti-abortion stance and, gun owners, appreciate his opposition to more gun regulations. Toward the end of the town hall, Delgado was asked how he would maintain his moral compass in office in the current political climate. The sign’s recent appearance coincided with the release of a new television ad by the National Republican Congressional Committee (NRCC), where the narrator states that Antonio Delgado, the Democratic nominee for Congress, who is African American, “claims he’s like us,” before playing 30 seconds of cherry-picked and spliced hip-hop lyrics over noticeably darkened, hooded images of Delgado, taken from a short music career he pursued over a decade ago. As anyone living here in NY-19 will tell you, this ad, and many just like it, have been playing non-stop on television, radio, and sites such as Hulu and YouTube since early July, backed by nearly $2 million in spending from the NRCC and Speaker Paul Ryan's Congressional Leadership Fund Super PAC (CLF). This isn’t the first time in history stoking racial prejudices has been deployed as an electoral strategy. But with a record number of Democratic House candidates who are people of color, the Republican party in 2018 appears to be abandoning its decades pattern of innuendo and coded language, and shamelessly taking these tactics to a new level – overtly race-based attacks against the candidates themselves. Antonio Delgado is a formidable opponent. And I should know, he beat me in the Democratic primary campaign just a few months ago. He is an inspiring campaigner and tireless worker who grew up in Upstate New York to parents working middle class jobs at GE. He’s a Rhodes Scholar and a graduate of Harvard Law School — the type of story we don’t see enough of here in Upstate New York — a committed husband and father. And he has the kind of diversity of experiences Congress is so badly lacking, from his career in hip hop advocating for social justice, to his time as an attorney spending thousands of hours championing pro bono causes including fighting for reduced sentences for juveniles facing life imprisonment. While politics is certainly not for the faint of heart, and both parties are guilty of running ads based on identity politics, this advertising campaign to appeal to the least common denominator crosses a line. 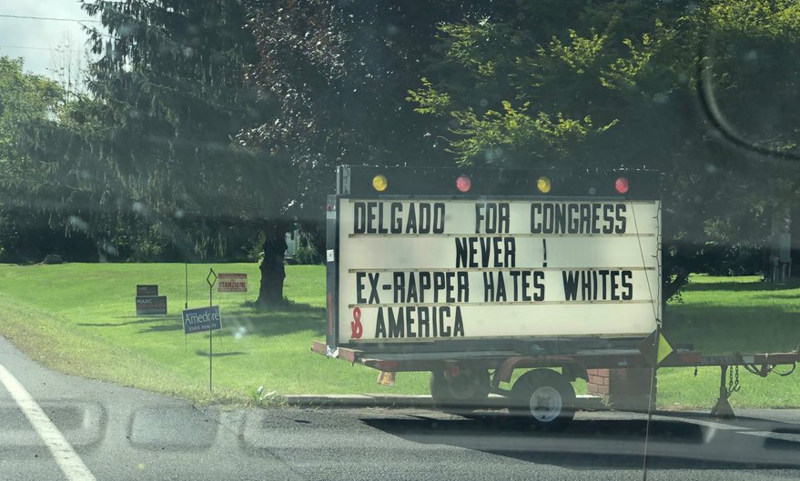 The barely veiled implication of the language that Delgado isn't “like us,” serves a simple purpose: to stir up fear in Upstate New York that a man born and raised in this community couldn’t possibly share our values simply because he is black and once was a music artist. It’s hard to see the feigned shock over Delgado’s lyrics as anything more than what it clearly is — race-baiting, and relying on the color of a candidate’s skin, rather than any policy or political differences, to convince the voting public (approximately 85% of which is white in NY-19) that Delgado is not deserving of support. Certain Republicans claim that President Trump’s racist statements and policies represent a different brand of politics than their own. Faso dubiously claims he has ‘no control’ over the advertisements.. His recent claim that "there's nothing racial about [the ad]” is either an outright lie, or reveals an astonishing lack of judgment from a sitting member of Congress about the obvious implications of this line of attack. However, unless Faso and Republican leaders openly disavow each of these ads, and Republican donors refuse to fund the NRCC and CLF as long as they run, they are wholly responsible. The good news is, from my experience in this community, I know these tactics won’t win out. During my primary campaign, I traveled to all 163 towns in this congressional district and the people I met, though we had plenty of disagreements, are certainly not the kind of people who will be easily fooled by such divisive tactics. To younger voters such as myself, hip-hop music is not something scary or threatening, it’s now the most popular genre amongst music fans (Kendrick Lamar just won a Pulitzer). People are showing up in record numbers to protest what’s coming out of Washington, to volunteer for campaigns, and to vote in primaries. In our congressional district alone, turnout doubled for the June primary and hundreds are volunteering every weekend. Republicans are scared, and they should be. But, while there are many permissible tactics in politics — some savory, some not — to draw contrasts between candidates, we as a nation, state, district, community, no matter which party we are in, are better than relying on stirring up racial prejudice to win elections. And I’m confident voters in the 19th congressional district and across the country will agree this November. Gareth Rhodes ran in this year’s Democratic primary for Congress in NY-19 and is the executive director of Show Up 2018. On Twitter @garethtrhodes. The congressional primaries in New York on Tuesday saw a shocking defeat for a Democratic party giant in Queens while other Democratic incumbents in the city held on with close margins. And on Staten Island, a closely-watched Republican primary ended with a wider margin for the incumbent victor than expected. All eyes will now turn to the general election, with the full slate of candidates in focus. Nationally, Democrats are attempting to claw back a majority in the 435-seat House of Representatives by flipping key Republican seats -- they currently hold 193 seats and Republicans hold 235, and there are seven vacancies -- while Republicans are hoping to fend off a blue wave that has put them on the back foot in dozens of races across the country. New York races are expected to factor significantly into the House balance of power. The Donovan seat is the only congressional district held by Republicans in New York City. 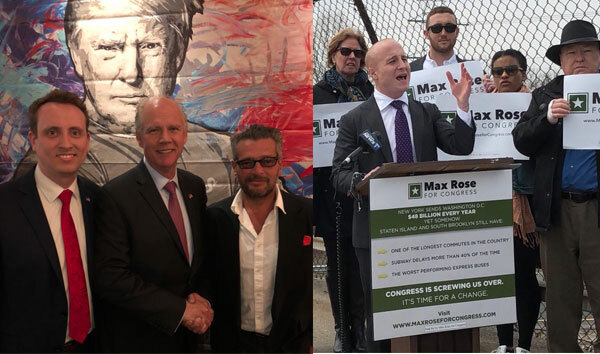 The Democratic Congressional Campaign Committee is more closely focused on Districts 11 and 22, under its organized ‘Red to Blue’ effort, backing army veteran Max Rose to challenge Donovan, and state Assembly member Anthony Brindisi against Tenney. And there are still other races where candidates are seen as more long-shots to win, but given the surprise leveled Tuesday by Alexandria Ocasio-Cortez against Democratic Rep. Joe Crowley and the successes of Democrats, especially women, in other races in New York and elsewhere since Donald Trump’s election, some additional districts may be in play. For example, Liuba Grechen Shirley won her Democratic primary Tuesday and will now attempt to unseat incumbent Republican Rep. Peter King on Long Island. Governor Andrew Cuomo, a two-term Democrat running for reelection himself, has also committed the state Democratic Party’s machinery to support Democratic congressional challengers. “Our focus now must turn to winning back the House of Representatives, and the road to accomplishing that runs right through New York State,” Cuomo said, in an email blast sent out by the state party on Wednesday morning. “The only way to stop Donald Trump and his hateful agenda over the next two years is to win back the House of Representatives,” he added, appealing for volunteers to join phone banking and canvassing efforts in the next few weeks. As New York and the country move toward November’s Election Day, congressional races are now set, while state-level primaries will happen on September 13 for all 213 seats in the state Legislature and the state-wide posts of governor, lieutenant governor, comptroller, and attorney general. While those elections are being fought out, throughout the summer and into the fall, there will also be a good deal of attention of the state’s most contentious congressional races. After a caustic primary battle, Rep. Dan Donovan, a former district attorney, emerged victorious over Michael Grimm, who held the seat before Donovan but resigned after pleading guilty on charges of tax fraud. Both candidates tried to ride the coattails of Republican President Donald Trump, tying their records to his own in a district that overwhelmingly voted for him in 2016 -- the district covers all of Staten Island and a small section of southern Brooklyn. Grimm, despite his felony conviction, had a strong base of support on Staten Island but Trump endorsed Donovan a few weeks before the primary, pushing him far over the top in what became one of the most hard-fought primaries across the state. Donovan claimed victory with 63.9 percent of the vote to Grimm’s 36.1 percent. On the Democrat side, decorated army veteran Max Rose emerged victorious with a similar vote share, pulling in 64.7 percent to beat five other Democrats for the nomination. Rose ran a well-funded campaign with support from the DCCC, raising a total of $1.6 million through June 6, according to Federal Election Commission filings. Rose was formerly an executive at a nonprofit health care organization and worked as director of public engagement and special assistant under late Brooklyn District Attorney Ken Thompson. He has received endorsements from several local and state-level elected Democrats as well as prominent national Democrats -- including U.S. Sen. Kirsten Gillibrand of New York and Rep. Crowley. He was also backed by the local Brooklyn City Council Member, Justin Brannan. The Working Families Party and the Women’s Equality Party endorsed him, as did several unions and political action groups. In a brief phone interview Wednesday, Rose said he will stay the course on his approach to the campaign. “The strategy does not change,” he said of moving on to the general election. Rose said his opponent “will do and say anything” to get reelected, including attempting to rewrite his record as he moves closer to the president. “So we’re gonna win the old-fashioned way. We’re gonna take it day-by-day, door-by-door, and Dan Donovan doesn’t stand a chance,” he said. Though the district is split between two boroughs, Rose said his pitch wouldn’t be determined by the community where he campaigns, but rather by the bread-and-butter issues that residents care about. “[W]hat matters is what is troubling voters each and every day,” he said, pointing to crumbling infrastructure, interminable commutes, an increasing cost-of-living and the hundreds of opioid overdoses in Staten Island. “We have got to earn voters’ trust first and then convince them that it does not have to be this way under any circumstances,” he said. For his part, Donovan used part of his victory speech Tuesday night to stress the importance of holding onto the GOP’s lone New York City congressional seat, and he connected the race to the larger battle for the House, warning his supporters that Democrats want to impeach Trump if they win control of the chamber. Republican John Faso currently holds the District 19 seat in the Hudson Valley and the Catskills but is widely seen as a vulnerable incumbent in a toss-up seat. A former state Assembly member, Faso won the seat in 2016 after the retirement of Republican Rep. Chris Gibson. Like Donovan, Faso voted against the recent tax cuts passed by Congress and signed by Trump, and has also criticized the president’s “zero tolerance” policy that separated thousands of migrant children from their parents. He ran unopposed in the primary and FEC filings show he has about $1.1 million in his campaign coffers. Faso’s Democratic opponent in the general is Harvard Law graduate and Rhodes scholar Antonio Delgado, who won in a crowded primary that saw millions in campaign money coming in for all the candidates. Delgado was endorsed by Citizen Action of New York, a progressive, left-leaning organization that is now one of the few groups at the core of the Working Families Party. Delgado secured about 22 percent of the vote, which was enough to place him first over six other Democrats. He outraised all his primary opponents and has about $759,000 left for the general election. Last night, Perry Gershon, a former businessman who’s framed his race as one against Trump, won the Democratic Party’s nomination to run in this eastern Long Island district. The Cook Political Report rates NY-01 as “Likely Republican,” and it went twice for Barack Obama before supporting Donald Trump in the 2016 election. Gershon will challenge two-term Republican incumbent Rep. Lee Zeldin, who won re-election in 2016 by 16 points over his Democratic opponent. As of June 6, Zeldin maintains over a 3-1 fundraising lead over Gershon. First-time candidate Democrat Liuba Grechen Shirley will challenge incumbent Republican Rep. Peter King, who has been in office since 1992, in this Long Island district that also voted for Trump after supporting Obama twice. King won his most recent re-election with 62.5% of the vote, defeating Democrat DuWayne Gregory, who also lost to Grechen Shirley in Tuesday’s primary election. The day after her primary victory, Grechen Shirley challenged King, who recently said that town halls “diminish democracy,” to a series of five public debates. The incumbent, as of the beginning of the month, has over $3 million on hand, while Grechen Shirley has slightly less than $150,000 left over after her primary campaign. Democrat Rep. Tom Suozzi won his seat in this district covering Long Island’s North Shore and part of Queens by a six-percent margin in 2016. NY-3 is narrowly Democratic, and it voted for Clinton in 2016 by the same margin as Suozzi. Republican challenger Dan DeBono ran unopposed in the Republican primary but, going into the general election, has less than one-tenth of the cash on hand as the incumbent. First-term Republican Rep. Claudia Tenney narrowly won this large, rural, and majority-white central New York district in 2016. Democratic State Assembly Member Anthony Brindisi, who faced no primary challenger, will challenge Tenney in the general election. Tenney is a hardline conservative endorsed by the Tea Party and the National Rifle Association, and the district went for Donald Trump by 16 percent in 2016. Brindisi’s fundraising has, at times, outpaced Tenney’s, and, as of June 6, the challenger maintains a $400,000 cash lead over Tenney. An April poll conducted by the Democratic Congressional Campaign Committee reported that 50% of voters in the district would favor Brindisi, who has been attempting to appeal to the district’s moderate Republicans, in the general election, compared to 44% supporting Tenney. In this central New York district that voted for Trump once and Obama twice, Democratic law professor Dana Balter will face off against incumbent Republican Rep. John Katko. Katko styles himself a moderate Republican, claiming to have written in Nikki Haley’s name for president in 2016, though he has voted in line with the president approximately 90 percent of the time. Running for a third term in the House of Representatives, Katko won both his previous races by margins of about twenty percent. He maintains a 13-1 fundraising lead over Balter, who advocates for Medicare-for-All, a carbon tax, and elimination of cash bail.